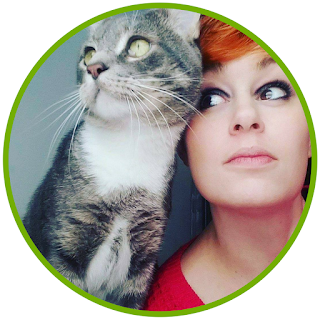 Practicing magic daily has been a hot topic in witchy groups everywhere, so I figured I would share some of the ways I have a magical day. First and foremost, I want to make it known that there is no rule that says you have to practice magic every day to be a 'good' witch. If I am honest, I don't often feel like I am practicing magic, even with a morning routine, and you might not either. That's okay. Sometimes I go weeks, even months without really practicing my craft. I encourage you to do what works best for you. You are still a witch, even if you aren't actively practicing magic. 1. Enchant your toothpaste with a protection spell. As a witch with a genetic disease resulting in the continuous break down of my teeth, this is something I recently started doing in an attempt to try anything that could possibly give me relief. First, I use a medicated toothpaste, so already on the protection train, but I also enchanted it for some extra help. There are several ways you can do this. For me, I sat the toothpaste next to some protective crystals related to teeth health such as fluorite and citrine that were charged with intent and lit a white candle. I asked that the crystals and candle work together to increase the protective nature of the toothpaste. Pretty simple really. 2. Carve protective sigils in your deodorant before use to bring you luck, prosperity, courage, patients, or anything else you need. This one is pretty fun. Use something sharp, like a paperclip to lightly carve your sigil into your deodorant. If you want your deodorant to bring the same characteristic, simply draw it in marker on the container itself. If you make your own deodorant, consider picking essential oils that could bring you whatever you are looking for. 3. Imagine all negative or unwanted energies washing away during your morning shower or face wash. This one is pretty simple. Personally, I don't shower in the morning often, but when I do, I imagine my troubles washing down the drain and the warm water bringing renewing energies. I do wash my face in the morning and imagine the same thing. 4. Cleanse your bed of old energy as you make it. I do this by fluffing the pillows and wiping the comforter and imagining I am beating/wiping out the negative, stale energy and charging it with positively. 5. Infuse your morning coffee or tea with intent. Some people do this by stirring it clockwise or drawing sigils. I do it by holding the cup and imagining I am infusing it with positive energizing energy. I love just holding the cup in two hands, closing my eyes, and breathing in the smell. I'm a tea drinker personally and love French Breakfast teas laced with honeysuckle. 6. Bless your keys for safe travel. Even if you don't drive, you likely carry a set of keys with you at all times. Ask them to keep you safe until you return home. Why not put a crystal keychain on your keys to amplify the magic? 7. Practice simple glamour magic. If you wear makeup, enchant your makeup. If you don't, enchant your facewash, face lotion, or shave gel for the same purposes. Personally, I like to draw sigils on my face in foundation because I am extra like that. You can do the same with whatever you are using in the morning on your face. Ladies and gentlemen, if you are NOT moisturizing, you best start. Get with it! 8. Eat REAL food. This seems kind of mundane, but eating processed foods screws up your aura and is just bad for you. Skip the cereal for something real like eggs, avocado toast, oatmeal, or fresh fruit. I eat avocado toast with a soft boiled egg on top. Sometimes I throw in a banana as well or save it for a snack later. 9. Briefly meditate, draw a tarot card, or practice yoga. If you have time, spend 5 to 10 minutes meditating or doing some yoga to get ready for the day. If you don't, simply drawing one tarot card to see how the theme of the day is quick and fun. I usually pull it, jot it down, and research it while I am eating breakfast. I don't do this very often though, instead preferring to zone out during breakfast. Yes, zoning out of my form of meditation. I do it while running too. 10. Say a mantra. Every morning before I leave for work, I say "I've got this." I often don't feel like I do. In fact, my anxiety is constantly telling me I don't, but saying it out loud helps me recognize that I do. Heck, just being positive and smiling while you say it will change your day. You can also just give gratitude in the morning. It is hard to be negative when you are being thankful. These are some quick and easy methods to infuse your morning with magic, and they are all gender neutral. I see a lot of lists out there that are geared more towards women and I wanted to remedy that a bit. 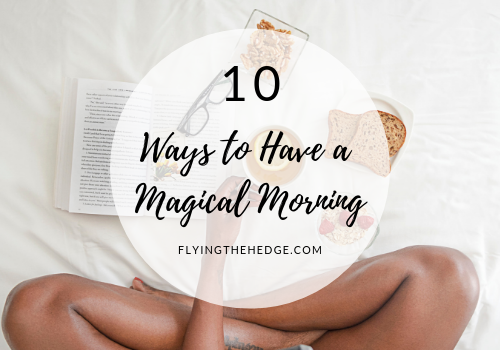 How do you make your mornings magical?